On July 9, fifteen Aboriginal youth from across Quebec and Ontario will be greeted at McGill for the second annual First Nations and Inuit Youth Leadership Symposium. The Symposium, organized by members of McGill’s Initiative for Diversity and Global Education, provides First Nation, Inuit, and Métis teen leaders a week of workshops and activities intended to help them bond with their peers and learn how to better improve their communities. Lily Ieroniawakon Deer (Mohawk Nation) and Wanda Etapp (Cree Nation), participants in the 2011 Symposium. Intended for leaders aged 14 to 18, the symposium is designed to connect young people with scholars, educators and activists from around the world, allowing youth the opportunity to identify and work through community identified concerns and questions and establish a community network for indigenous youth. Symposium organizers hope to help build on strengths, skills, and knowledge that youth already possess while developing new ones for the future. The program has evolved since its first installment, now including increased emphasis on building and strengthening youth relationships. Exploring issues of youth community activism, the workshops will range from art and sexuality to community mapping and social justice through hip-hop, while addressing the issues that matter most to these teen leaders. 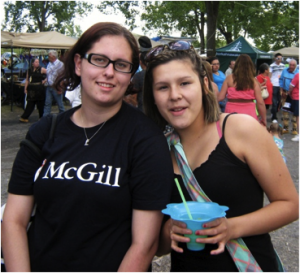 The week will culminate with the group spending the day enjoying the cultural festivities of the Kahnawake Pow Wow. The young people attending the symposium have been nominated by their schools, families and communities for their exceptional leadership qualities and their desire to contribute in positive ways. This year’s participants are Naskapi from the community of Kawawachikamach and Cree from the communities of Wemindji, Oujé-Bougoumou, and Attawapiskat. Christine Smith is the Publicity Coordinator for the McGill First Nation and Inuit Youth Leadership Symposium.